Helen and Darian had a great time traveling in Vietnam and Thailand in April. Over the next few weeks some of our adventures will be appearing on Head First. 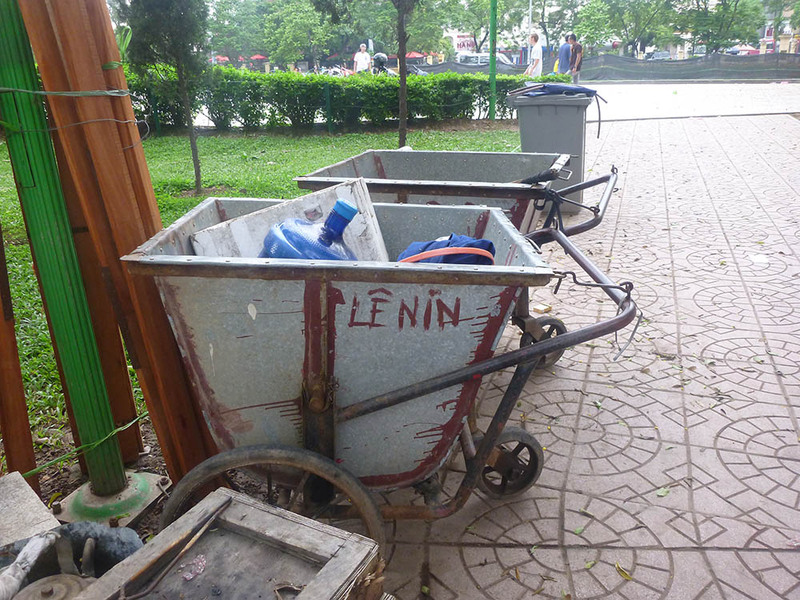 One of the many interesting things about Hanoi was seeing how communist tradition and consumer life interacted. There are plenty of communist symbols to remind you what the country is about. And there are plenty of places to buy them. One stall’s wares included a bust of Ho Chi Minh and a US Army sticker. 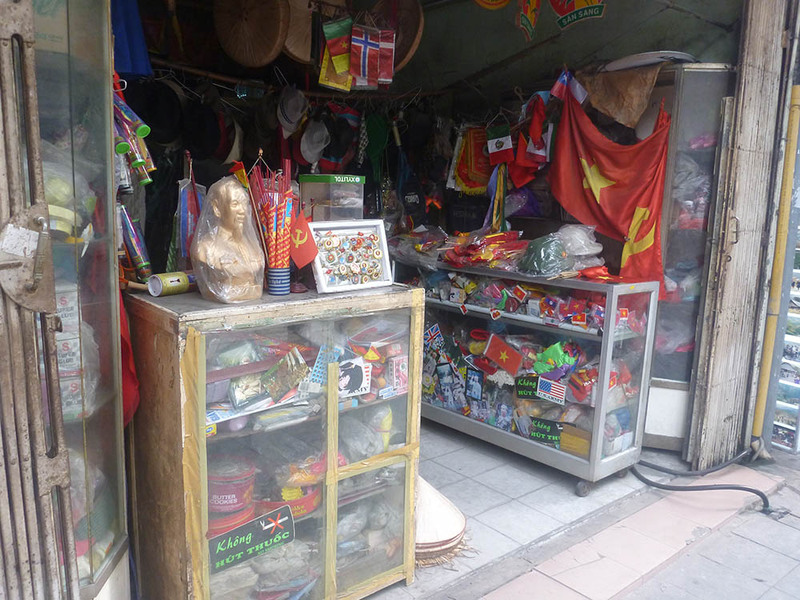 There are all kinds of shops in Hanoi. If you’re into busy urban streets, you’ll probably like the Old Quarter. It feels chaotic and overwhelming if you are not used to the road rules (or the humidity), but there is a kind of order that people seem to go by. 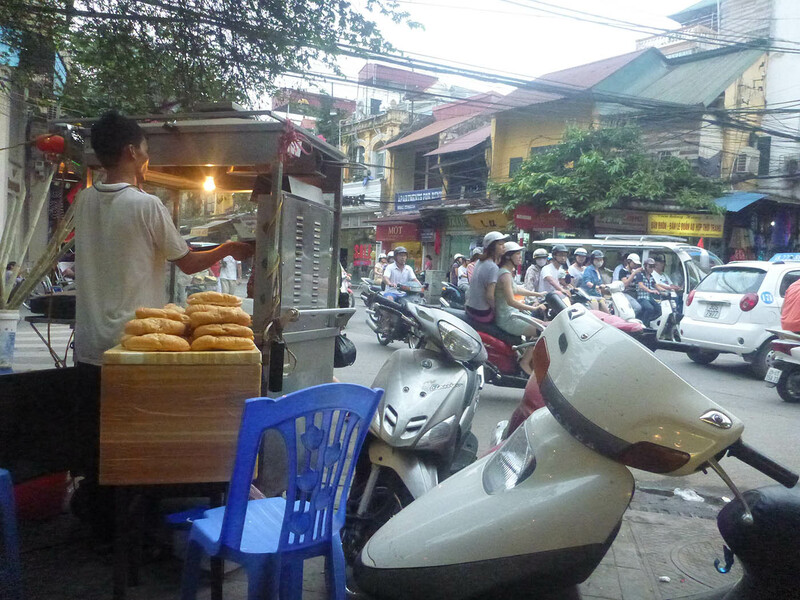 It’s good to watch from a stool on the sidewalk/scooter parking zone while you enjoy a streetcart banh mi. If you want to brave the traffic on a skateboard, a comrade can help you out. 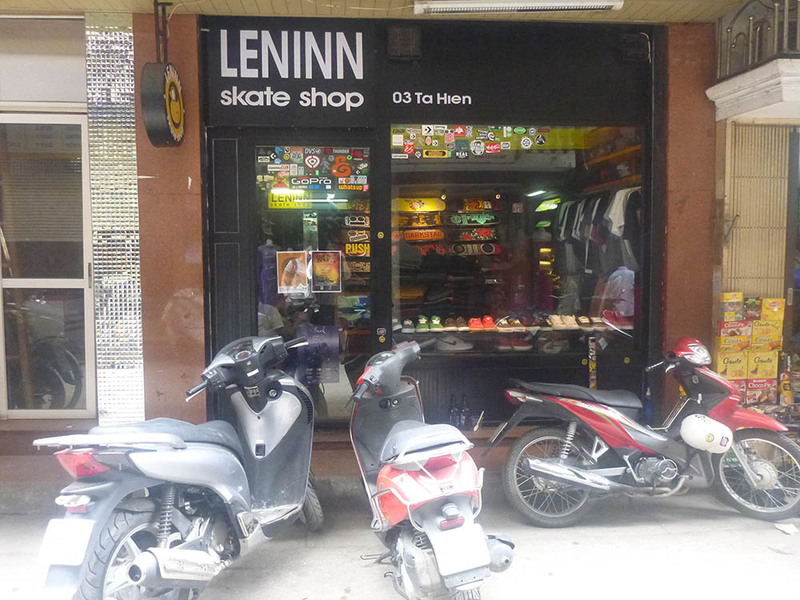 But Lenin is not just a name on a skate shop. The Marxist revolutionary and founder of the Soviet state also looms over a park where people skate. We found a less flattering monument nearby. Across the street from the Lenin statue is a row of ATMs. 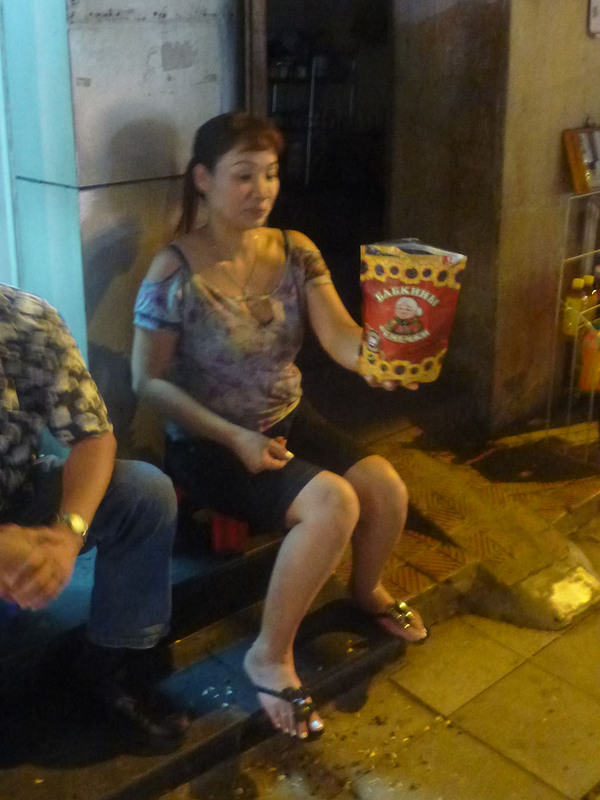 As a functioning city, Hanoi has many places to do things with money. Just down the street from this building sporting bank logos is a marvel of communist architecture. A good place to get a handle on how Vietnam presents its history is at the military museum, across the street from Lenin. 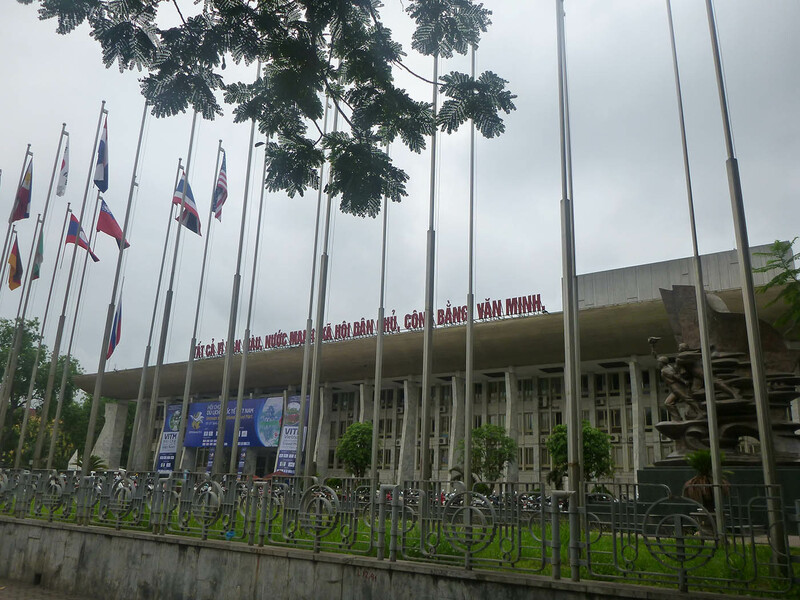 It is in a less-congested area of the city, where you will find broad streets, actual sidewalks, and embassies. The tower in the background is part of a historic citadel that was overrun when the French took over Vietnam in the late nineteenth century. 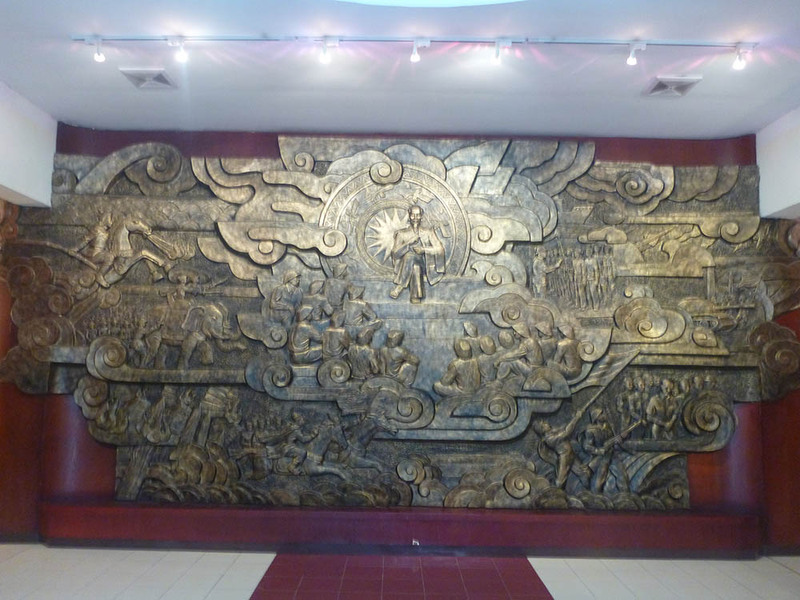 Inside the museum is a large metal mural commemorating Ho Chi Minh. 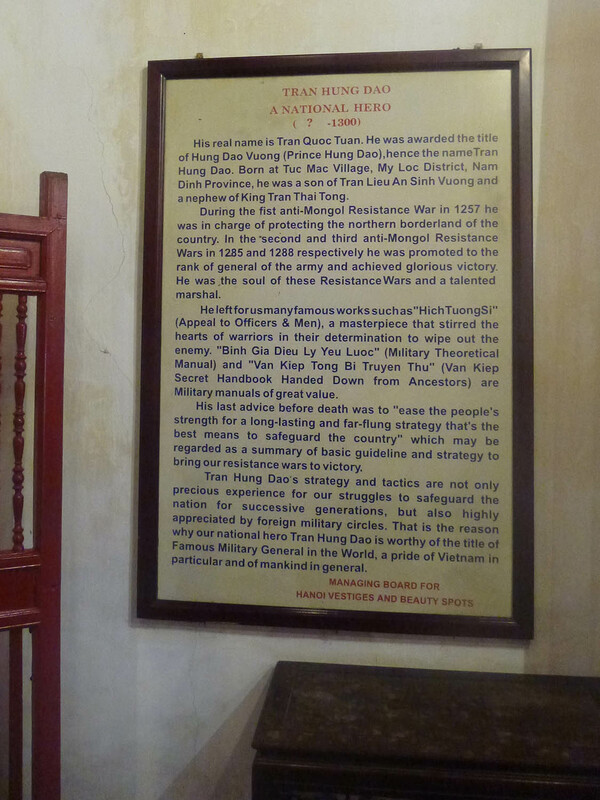 But Vietnamese military history starts much earlier. 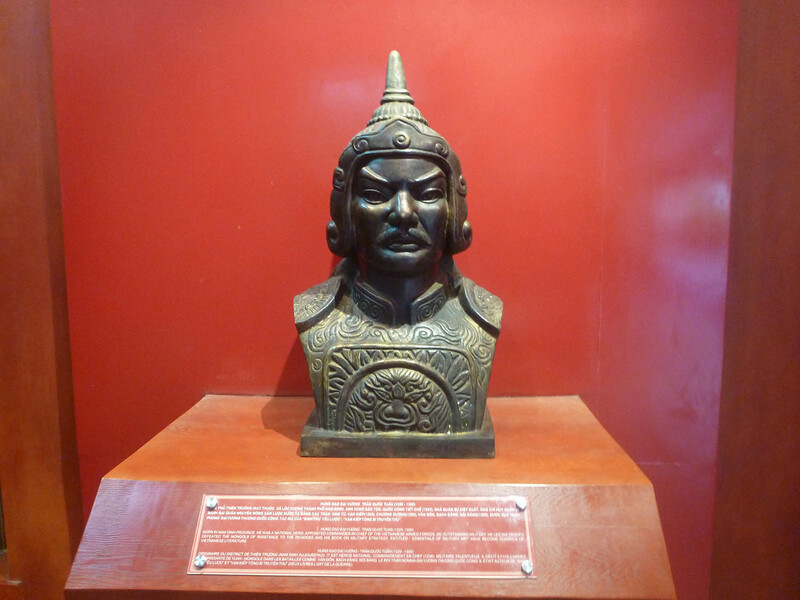 One of the country’s early military heroes was Tran Hung Dao, who defeated Mongol invaders in the thirteenth century using the strategies of protracted warfare and guerrilla strikes. 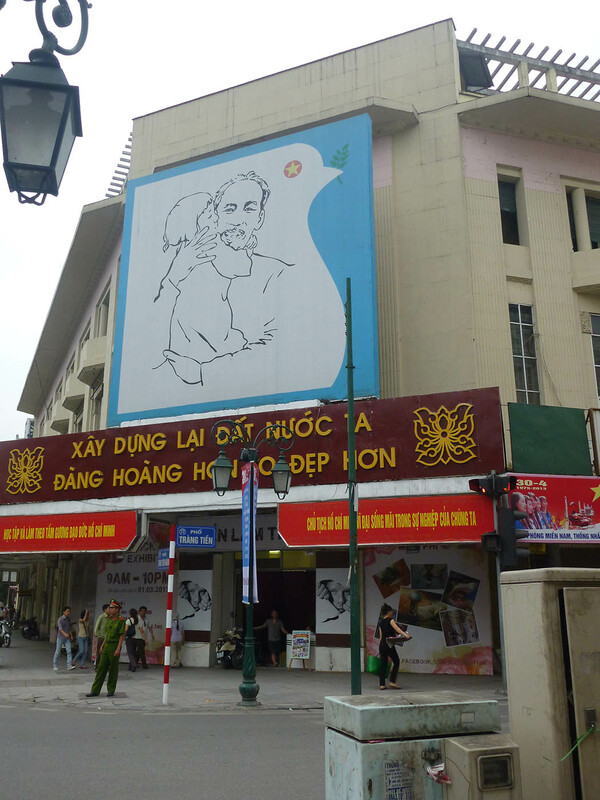 Vo Nguyen Giap, a history professor who would direct the military campaign against the French and Americans in the twentieth century, looked to the strategy written by Dao. Dao is celebrated outside of the military museum too. A historical sign at Hoan Kiem Lake also commemorates his success. 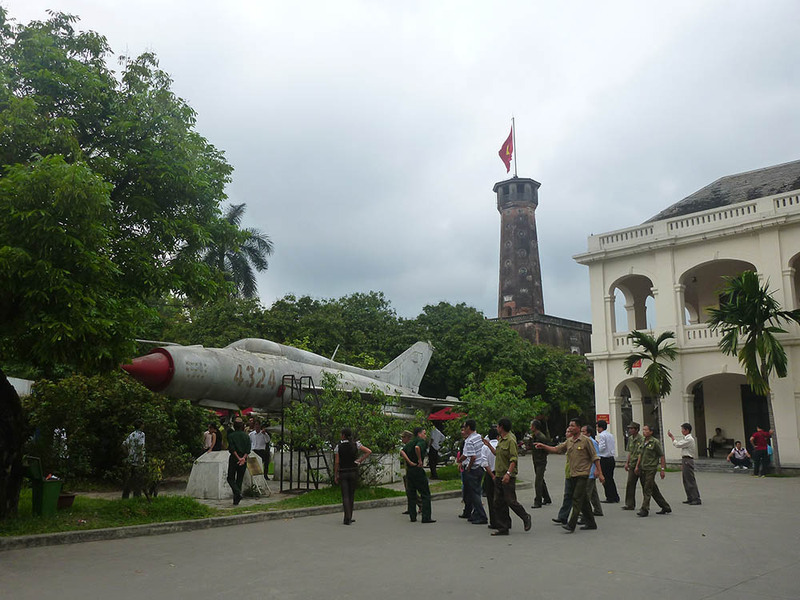 Much of the military museum highlights the twentieth century struggle for a united, independent Vietnam, first during the Second World War (1939-1945), then against the French as they tried to re-establish their colony from 1945 to 1954, then against South Vietnam and its American supporters (1959-1975). 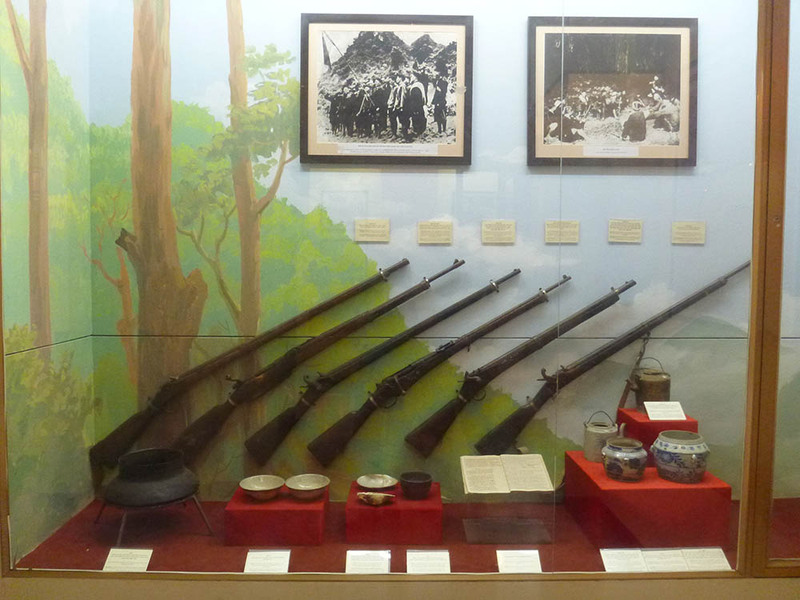 The military museum displayed some of the weapons used to resist the Japanese and French during the Second World War. They appear to include nineteenth century percussion cap muzzle-loaders. 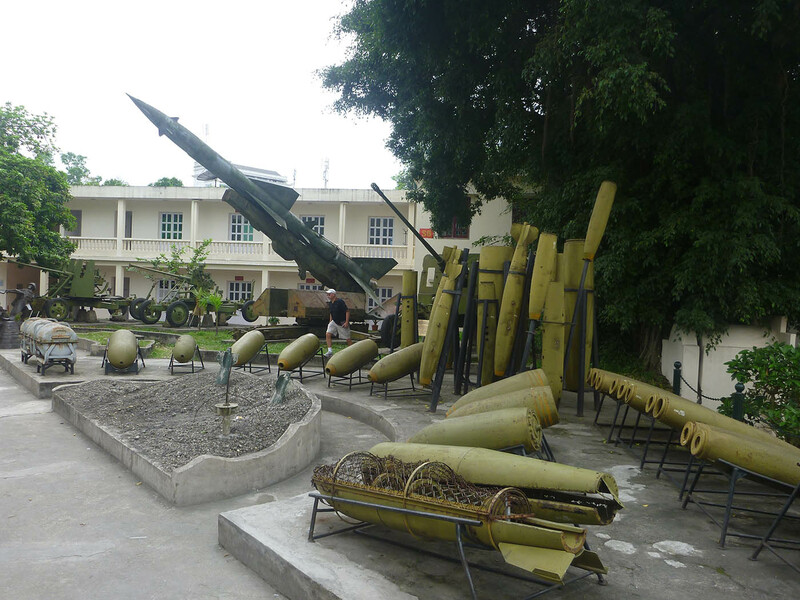 Later the Vietnamese were able to use captured enemy weapons and weapons supplied by the Soviet Union and China. A number are on display in other rooms of the military museum, many accompanied by captions that list dubious numbers of enemy soldiers a particular hero killed with the gun. Ho Chi Minh brought a couple of guns with him when he returned to Vietnam in 1941. 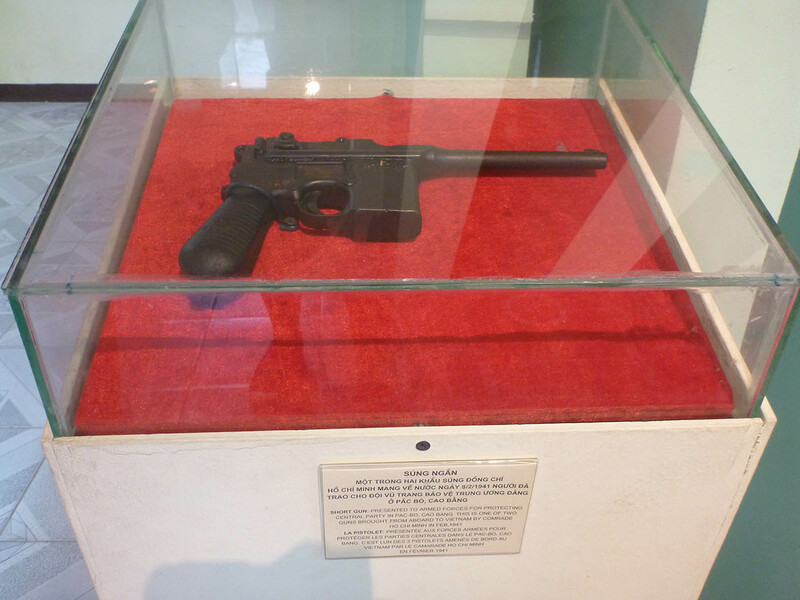 They include a Mauser C96 pistol, a model carried by Winston Churchill, Lawrence of Arabia, and Han Solo. It was also popular in the Chinese underworld around the time that Ho Chi Minh lived in China, so that might be where he got it. Extremely dedicated or unfortunate rebels were armed with anti-tank bombs that usually killed them when they exploded. The classic spike-filled hole is also on display. The yard outside is full of planes and vehicles, including captured American hardware. 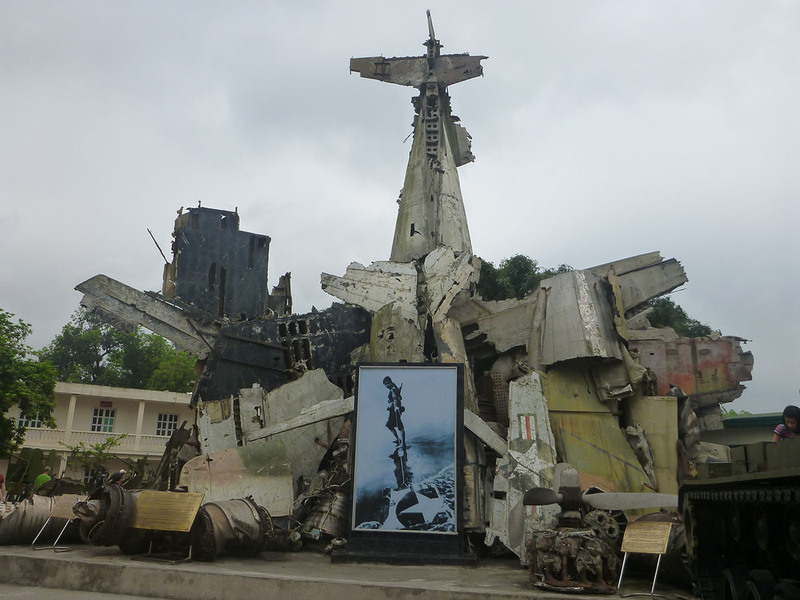 In the center of the courtyard is a pile of wreckage from downed airplanes. Behind the rubble are unexploded bomb casings and Soviet-made anti-aircraft weapons, including a very menacing missile. 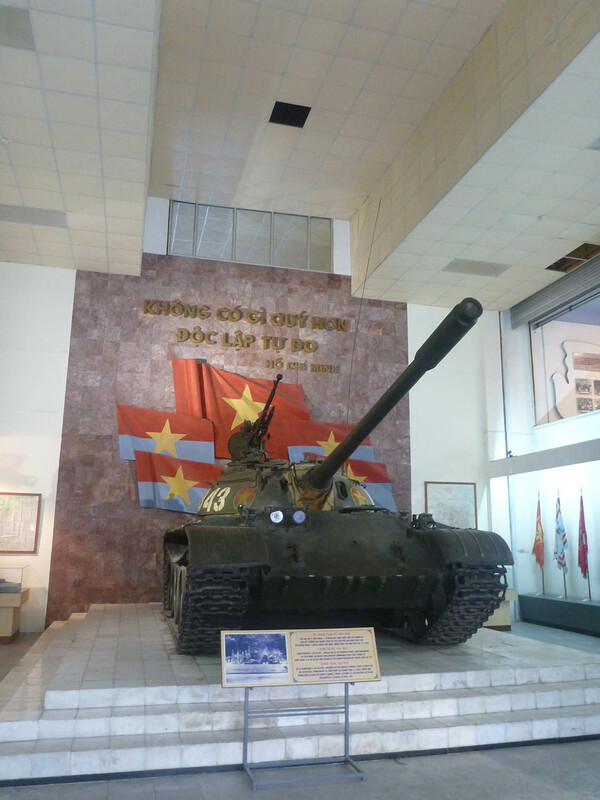 If you have seen a lot of pictures or documentary footage from the Vietnam War, you might recognize this tank from the courtyard of the presidential palace in Saigon. There were also exhibits commemorating anti-war protesters. I did not see the infamous photo of Jane Fonda sitting at an anti-aircraft gun. 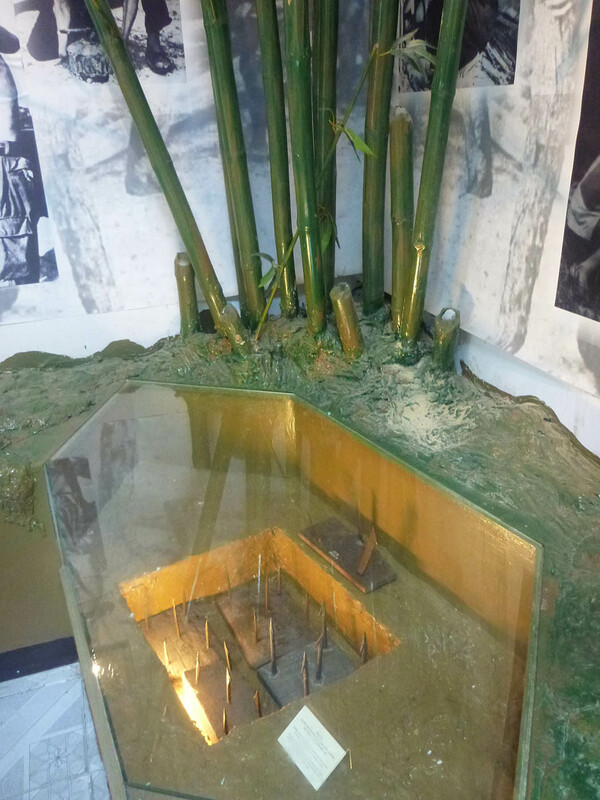 It was interesting to see how the struggle for independence and nationhood was presented to Vietnamese and foreign visitors. 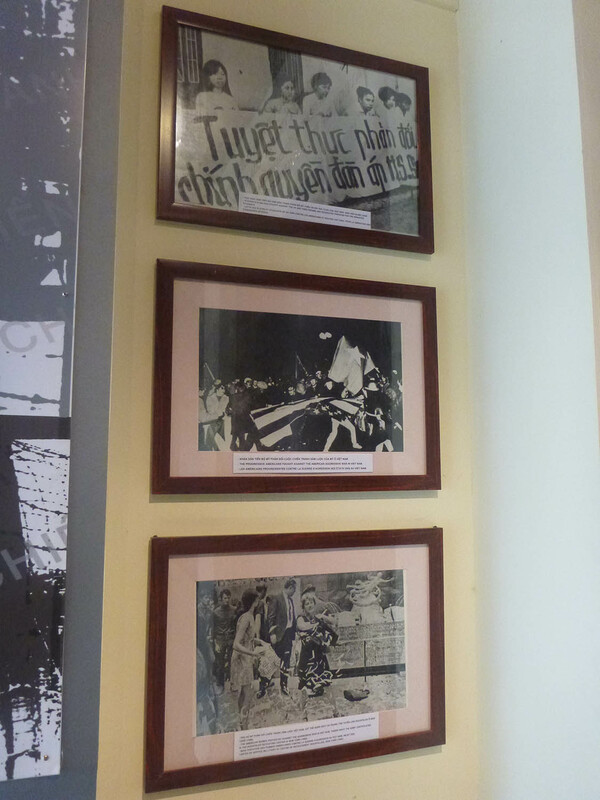 Not surprisingly, war crimes and excesses committed by communist forces were not apparent at the museum. It is often difficult for a country to deal with the human costs of its founding, and as a country formed only in 1975, Vietnam is still in the infancy of writing its history. It seems like freedom of expression is gradually increasing as the country becomes more open and less militarist. 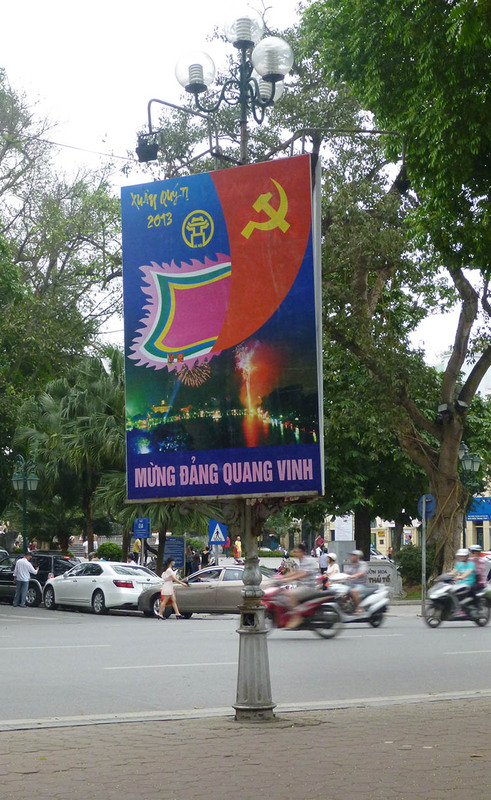 We were in Hanoi on the eve of one of its most important holiday weekends – celebrating the April 30 unification of the country after the surrender of the South Vietnamese government. It will be interesting to see how the country thinks about unification a few decades from now. 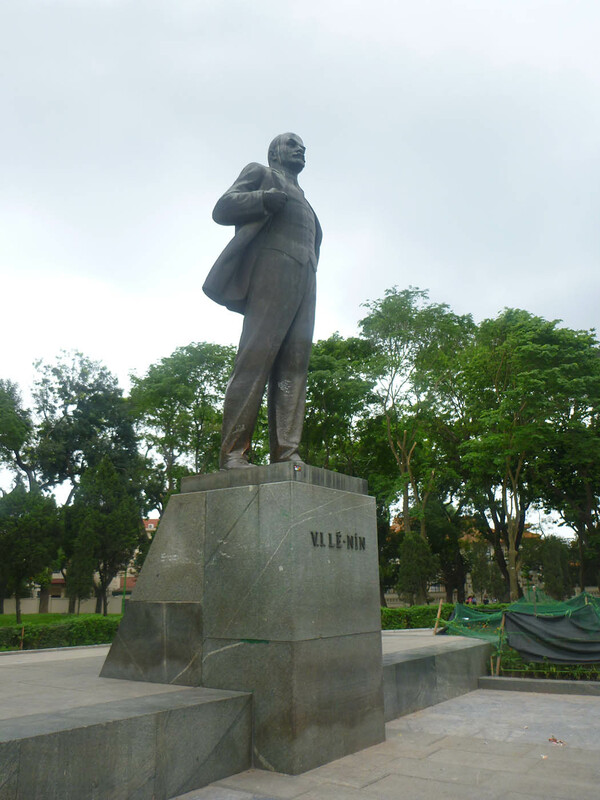 Ho Chi Minh figures prominently in Vietnamese history. He was born Nguyen Sinh Cung on May 19,1890 in a small impoverished village. His father was a minor official in the colonial administration who had been dismissed from service for nationalist politics. Nguyen traveled extensively by working on a ship crew. 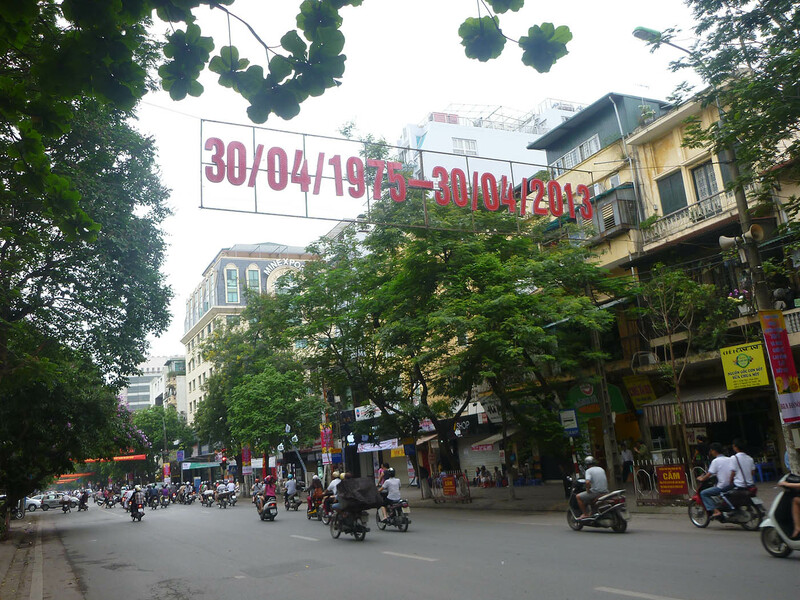 Nguyen was driven by a strong sense of patriotism and a commitment to socialist ideas. While in Europe, he petitioned the victorious Allies at the Versailles Conference in 1919 to extend the principle of self-determination to Indochina, where his countrymen suffered under colonial exploitation. He also became a member of the Communist Party in France. After studying in Moscow and organizing Vietnamese exiles in China, he returned to Vietnam during the Second World War to get involved in the nationalist struggle, which was funded by the US government as an anti-Japanese force. He took his final alias Ho Chi Minh, “he who enlightens,” in 1943. Instead, his embalmed body was put on display in a copy of the Lenin Mausoleum. I suppose they could eventually cremate his body. 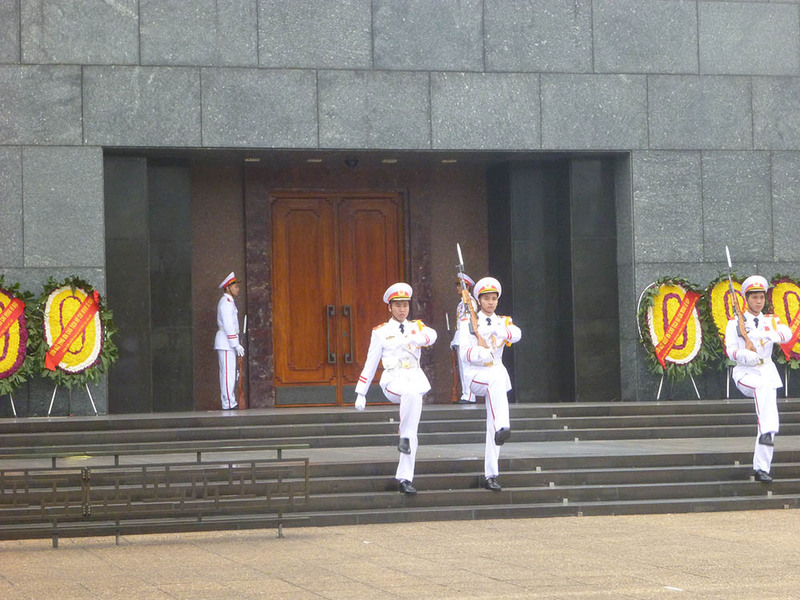 The mausoleum has a very formal changing of the guard ceremony. We did not try to go inside the mausoleum. Presumably it was closed since there was no line to enter. 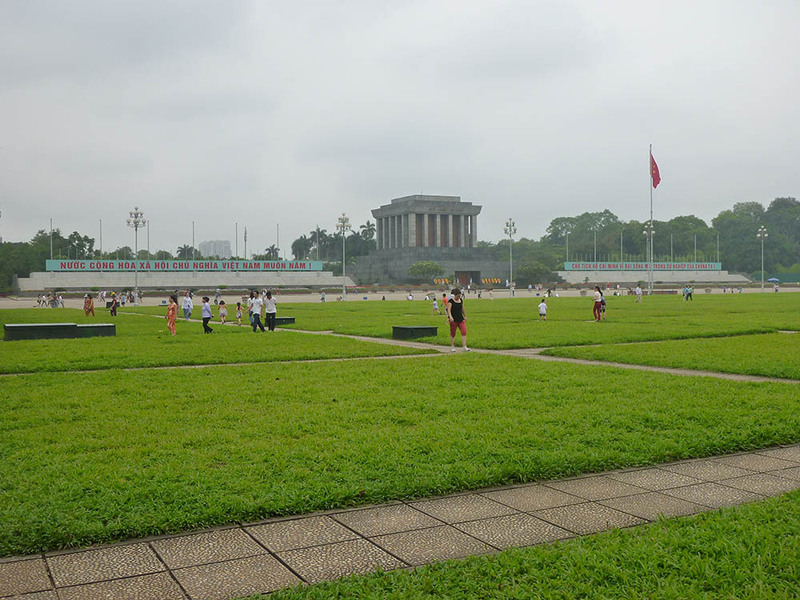 We did go around the back, where a nice garden is filled with the sounds of Ho Chi Minh songs coming from speakers. It is kind of like if the Lincoln Memorial actually contained Lincoln’s preserved body, and speakers around it played songs about him. Kind of weird. Many Americans in the mid-1960s did not understand that the Communist world was not a monolithic camp. China and the Soviet Union both provided technical and management assistance to North Vietnam starting in 1955. Yet Ho Chi Minh and other Vietnamese Communists were determined to remain independent actors, especially as it was clear that the more powerful communist states had their own geopolitical interests that did not always favor a strong, united Vietnam. Throughout the war with America and South Vietnam, the Vietnamese communists tried to steer a course between their big allies, even as Soviet and Chinese troops fought each other in border skirmishes in 1969. By the end of the 1970s, tensions escalated between Vietnam and China. Tensions were heightened by border disputes between Vietnam and Cambodia that eventually resulted in Vietnamese military forces deposing the brutal Khmer Rouge, who were allies of China. Relations worsened when the Vietnamese carried out policies that especially burdened ethnic Chinese residents. The Vietnamese pulled closer to the USSR. A brief war between Vietnam and China erupted in 1979. The enduring Russian influence can be seen not only in the sickle and hammer, but also in some of the products for sale. 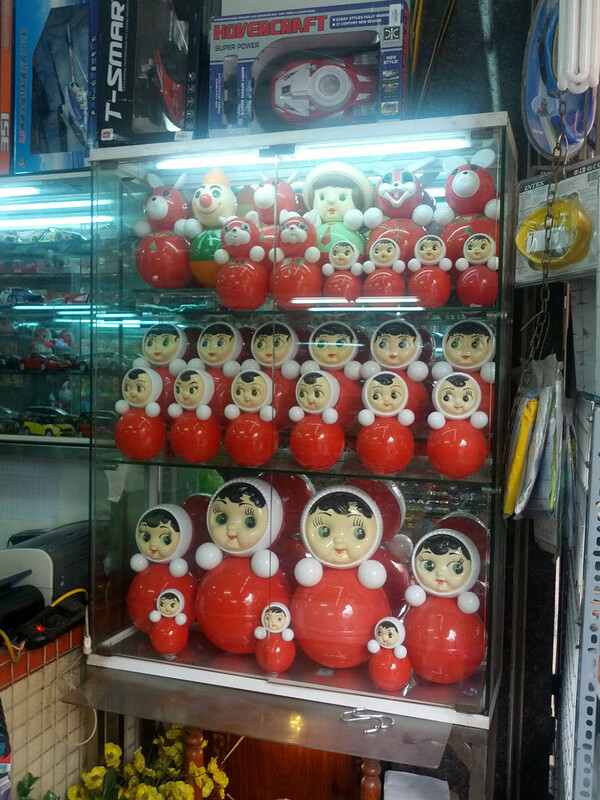 One toy store had a display full of Russian nevalyashka dolls. 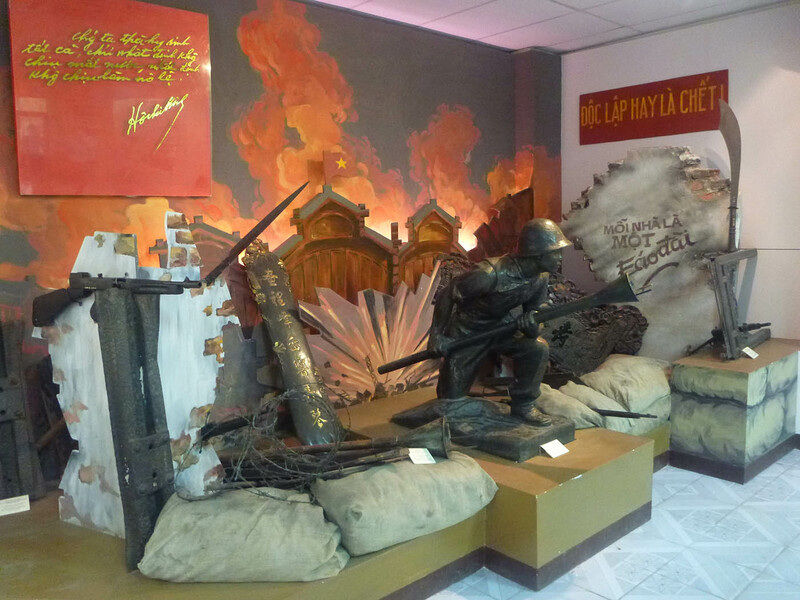 The multi-ethnic character of Vietnam was noticeable at the Vietnamese Women’s Museum, which had exhibits on women’s life and marriage ceremonies for the numerous ethnic minorities of Vietnam. The museum also featured some interviews with women who worked as street peddlers. One of them said she started working as a peddler after the family farm was taken for land to build a factory. That seems a bit different from what this picture of revolutionary female farmers conveys. 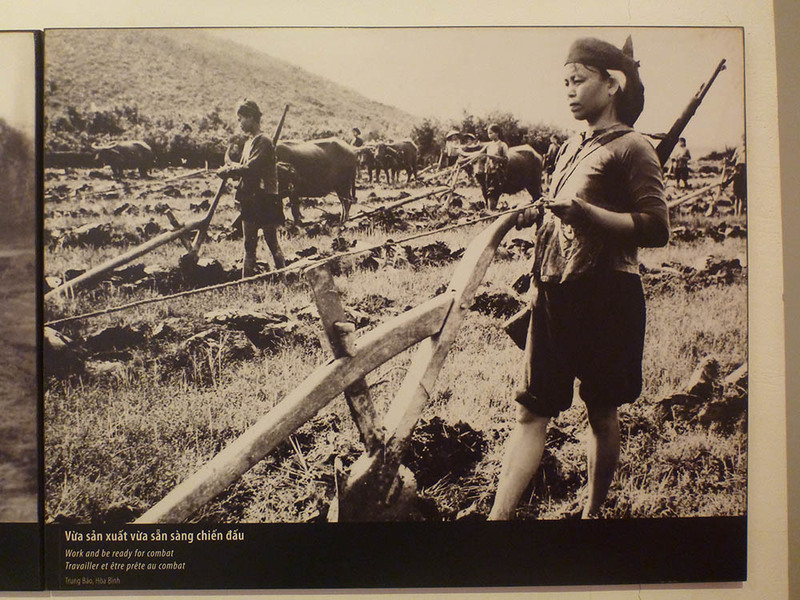 Vietnamese land policy caused trouble as early as 1956. Land reform was a major issue in nations that were emerging out of colonization in the years after World War II, as large colonial and feudal landholdings based on political access had impoverished many rural workers. 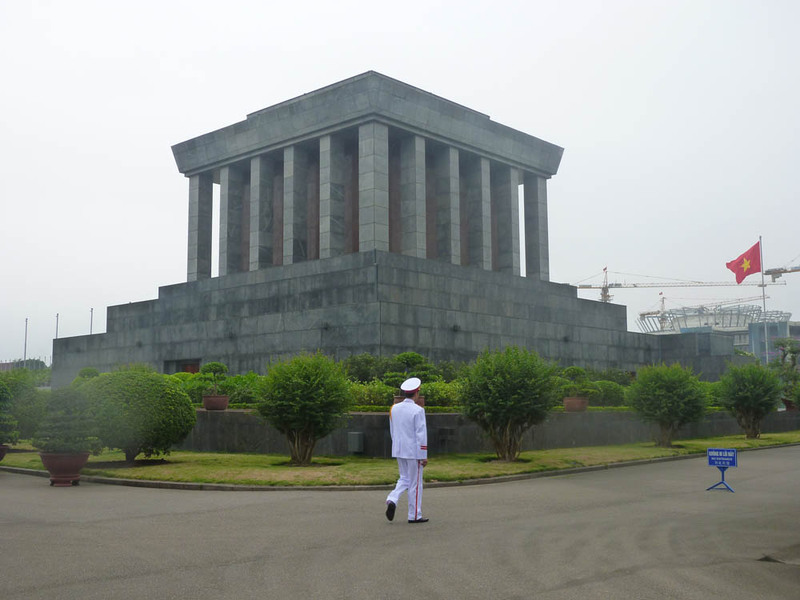 North Vietnam’s communist ideology and desire to industrialize energized their land politics. Landlords as well as relatively prosperous peasants who were classified as landlords by political cadres were dispossessed, beaten, imprisoned, and sometimes killed. A backlash resulted in the program being cancelled, prisoners released, and a public apology from Ho Chi Minh. Yet the communists were more responsive to the needs of rural people than the government of South Vietnam, which was a major reason for their success. Of course, there is much more to Hanoi’s thousand years of history than the war that America lost and the political system that frightened Americans enough to send thousands of men across the world to kill and die to protect a non-democratic and poorly-run state with little popular legitimacy. 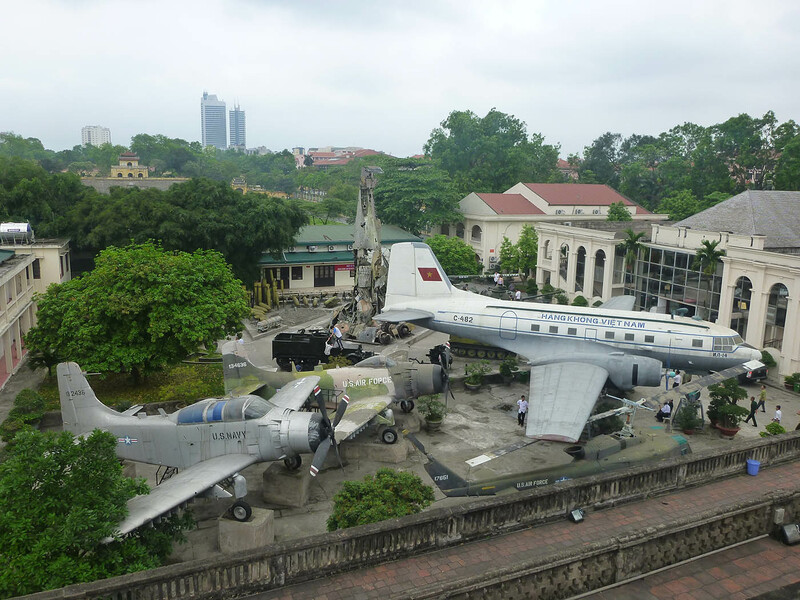 A good place to get a handle on the rest of Hanoi’s history is the Museum of National History. Unfortunately we did not get to see as much of it as we would have liked because the museum – the entire museum – closed for lunch and we did not have time to come back. But we did see this epic painting. 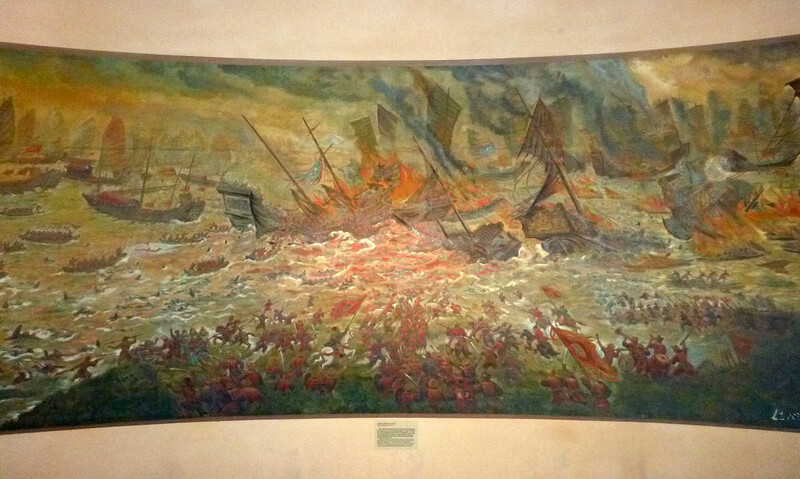 The caption at the bottom was not readable in the photo, but it appears to be a picture of the Bach Dang naval battle, where the Mongol fleet was defeated in 1288. And who doesn’t like epic paintings? Vietnamese folks are not that different from us even if they do some things differently. They use WiFi and eat the same Russian sunflower seeds that we can get in New Jersey. As long as you prepare yourself with advice from travel books and a sense of adventure, Hanoi is an excellent place to spend some time while exploring Vietnam. Brigham, Robert K. Battlefield Vietnam: A Brief History. PBS.org. “China and Vietnam: a timeline of conflict.” CNN. Garthoff, Raymond L. Detente and Confrontation: American-Soviet Relations from Nixon to Reagan, Revised. The Brookings Institution, 1994. Sino-Soviet border clashes, 228. Soviet-Chinese-Vietnam relations and Cambodia war 661, 729, 767, 785, 790. Moss, George Donelson. Vietnam, an American Ordeal, 3rd Ed. Prentice Hall, 1998. Tran Hung Dao, 8. 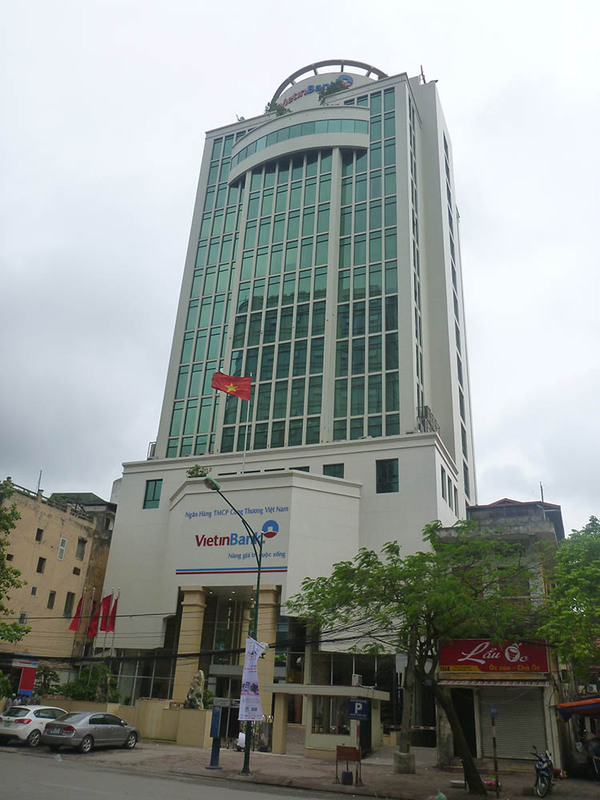 Ho Chi Minh, 18-23. 1956 land policy, 91. Chinese and Soviet aid, 90. Communist war crimes, 280, 408. “People and Events: Ho Chi Minh.” American Experience.